The only objects scooped up have been “fishing equipment and other flotsam” not connected to the Malaysia Airlines plane. PERTH, Australia — Despite what Australia called an “intensifying search effort,” an international hunt Sunday by aircraft and ships in the southern Indian Ocean found no debris linked to the Malaysian jet that vanished more than three weeks ago. But at least four orange objects that were more than 2 meters (6 feet) in size were seen by the crew of an Australian P3 Orion search plane, said the pilot, Flight Lt. Russell Adams, after returning to base. The planes taking part in Sunday’s search included three Australian P3 Orions, a Japanese P3, a Chinese Il-76, a Korean Orion, a U.S. Poseidon, and two Malaysian C-130s. Eight ships were on the scene, an area roughly the size of Poland or New Mexico, about 1,850 kilometers (1,150 miles) west of Australia. The vessels include the Australian navy supply ship HMAS Success, which was designated to carry any wreckage found. Abbott said a former Australian defense chief, Air Chief Marshal Angus Houston, will head a new center in Perth for search and recovery operations, coordinating the international effort. Searchers were hampered by rain and low clouds, but still were able to look for debris because of visibility of about 10 kilometers (6 miles). It takes planes about 2 1/2 hours to get to the area, allowing a five-hour search before they must return. For a full week, searchers relied on satellite imagery from various countries as they tried to find the plane in a zone to the south of the current area. They abruptly shifted the site Friday after authorities concluded the plane could not have traveled as far as they had thought based on its estimated speed and fuel consumption. The Ocean Shield, an Australian warship with a U.S. device that detects “pings” from the flight recorders was joining the search. It will still take three to four days for the Ocean Shield to reach the search zone. “The ship will take part in the surface search until the debris is positively identified and an underwater search area is then predicted,” U.S. Navy Capt. Mark Matthews said. The area is dominated by a muddy ocean floor known as Broken Ridge, which is actually a plateau where depths range from as shallow as about 800 meters (2,625 feet) to about 3,000 meters (9,843 feet). At the edge of the plateau closest to Antarctica is the Diamantina trench, which has been found to be as deep as 5,800 meters (19,000 feet) within the confines of the search zone, although it could be deeper in places that have not been measured. Information on the flight data and cockpit voice recorders may help investigators resolve what happened on Flight 370. Speculation includes equipment failure, a botched hijacking, terrorism or an act by one of the pilots. At a hotel near Kuala Lumpur, a group of Chinese relatives of passengers on the plane demanded that the Malaysian government apologize for its handling of the search. They also are angry that Prime Minister Najib Razak announced March 24 that Flight 370 went down in the Indian Ocean before any wreckage was found. The group, which flew in from Beijing, waved banners that read: “We want evidence, truth, dignity,” and “Hand us the murderer. Tell us the truth. Give us our relatives back.” They also demanded a meeting with Najib. Two-thirds of the 227 passengers were Chinese. China has urged Malaysia to be more open about the investigation, while Malaysian officials have defended their handling of the probe and the information they have provided to the relatives. In Beijing, tensions were still high at a hotel where other Chinese relatives have been meeting with Malaysian representatives. On Sunday, one woman asking questions called Malaysia Airlines “criminal suspects” to applause from the crowd of about 250 people. Relatives asked why materials being shown to them were in English and not Chinese. Malaysia Airlines said it would fly family members to Perth, but only once wreckage is confirmed to have been found from the plane. It said a family assistance center would be set up in Perth. In Sepang, Malaysia, not far from the airport where Flight 370 originated, Lewis Hamilton of Britain won Formula One’s Malaysian Grand Prix and dedicated his win to the victims of the flight and their relatives. Before the race, fans held a moment of silence. 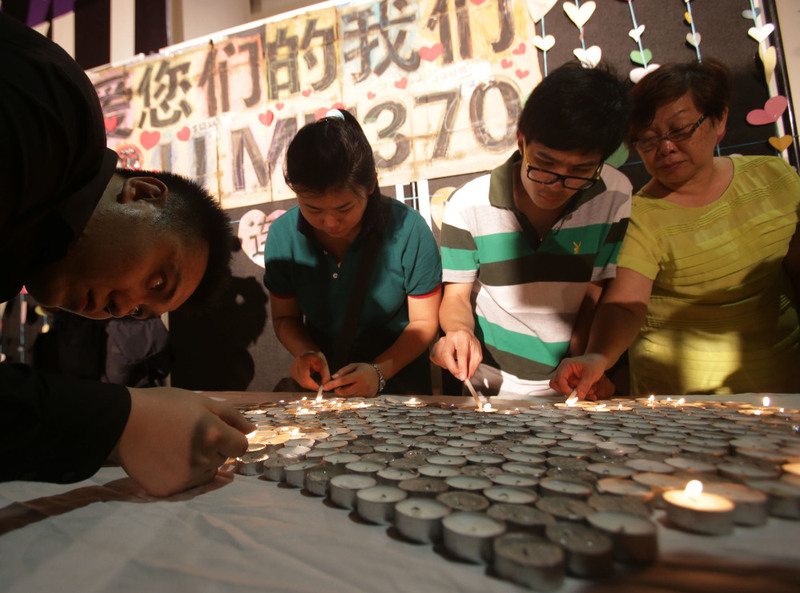 “We hope very soon there is news to give comfort to the families,” said spectator Chris Sprangers of Australia. Wong reported from Kuala Lumpur. Associated Press writers Scott McDonald and Eileen Ng in Kuala Lumpur; Chris Lines in Sepang, Malaysia; Kristen Gelineau in Sydney; and Rod McGuirk in Canberra, Australia, contributed to this report.